Two of Michigan's incoming freshmen were taken today in the NHL Draft. Gibson said he believes he needs at least two years at Michigan as far as a timetable but "at the same time, it's all up to what their needs are and if they think I'm ready to take the next step." Here's an article about Gibson from Anaheim's website. There was a pre-Draft article from The Sporting News comparing Gibson and former Michigan verbal Jack Campbell. It doesn't sound like Anaheim is going to rush him, though they have run into some goaltending troubles, with Jonas Hiller's vertigo-like symptoms. They had four goalies start 10+ games last year. “In today’s game, with the way he skates and the way he moves, along with his size, he’s a very interesting prospect." In Lou We Trust had a nice profile of Serville in the lead up to the Draft. Michigan has announced their schedule for the upcoming season and they did a pretty nice job catering to a fairly young team that is probably going to struggle to score goals at times. The schedule is front-loaded with home games, and with the loss of the College Hockey Showcase they didn't exactly load up the non-conference schedule. There are also a surprising number of mid-week games. The Wolverines will open against Niagara on a Tuesday before a weekend series against Bentley. St Lawrence comes in on a Thursday. We'll also have home games against Union and Northeastern in the non-conference slate. We do get Boston College in the first round of the GLI. Noticeably absent is the WCHA. Michigan Tech is the only WCHA team that we could potentially face. Man I wish we had beaten Duluth, so I could make a joke right here. The schedule is heavily front-loaded with home games. Michigan plays 12 of their first 16 at Yost, though they do open the CCHA slate on the road against Northern. After the GLI, Michigan has just six home games, which does include a home series against Hockey's Dynasty. The Regionals this year are in Bridgeport, Green Bay, Worcester, and (shocking!) St. Paul. I look forward to the Gophers missing the tournament again. The Frozen Four is in Tampa. Also note that the outdoor game in Cleveland is absent at this point. They were supposed to officially announce it last week, but it sounds like there's still some work to be done. MGoBlog has a take on what the schedule means from a PWR perspective. Michigan officially announced Michael Szuma, Andrew Sinelli, and Mike Chiasson as a part of the 2011-12 team. Not that they don't like all the recruits, but it sounds like they really like Chiasson. Edit: Guptill is 27 and we think di Giuseppe and Guptill is 7. Lynch is switching to 14 and DeBlois is switching to 19. Mark Burns has a nice story about Zach Hyman, who could be the first in a family that becomes Michigan's version of the Millers. There were questions about why he didn't join Princeton as an 18-year-old, and it turns out that Princeton coach Guy Gadowsky wanted him to play another year and feel what it was like to be "The Man" at that level. Mission accomplished, and it's Michigan's gain. MHNet has some stuff about our players who should go in the NHL Draft this weekend. +1 for the bit about the two Gibson goalies. He also mentions that Max Shuart just obliterated the Muskegon Lumberjacks tryout camp. His team won 5-0 and he had 3-2--5 in the game. Fun times in Cleveland this winter! Cleeeeeeeeeeeeeeeeeveland! Stephen Nesbitt reported the game will be January 15, 2012. I had heard that the game would be played on a Sunday (following a game at The Schott on Friday), so that makes sense. This would be the fourth outdoor game for Michigan (and the third for a good number of players on the team) and the second for the Buckeyes. They played Wisconsin at Lambeau Field a few years back. And if you don't think for a second that I won't be getting my picture with the Moses Cleveland statue, you're crazy. He's the guy who invented Cleveland, YEAH!!! I'm excited. I've always been of the position that more outdoor hockey is a great thing. That doesn't even include the rings, which should be added today. As much as I'll miss "GO, FIGHT, WIN! 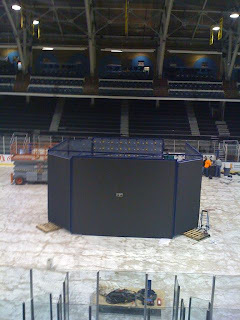 ", the new scoreboard is going to be awesome! Also, MHNet mentioned that Northeastern will be visiting Yost this season. They'll play the day after Thanksgiving, since Wisconsin wussed out of the College Hockey Showcase.